This blog will explain you how to host your own web-hosting server and your website on it. This is written specially for beginners/students to gain the web-hosting concepts in a better way. Before i proceed further, let us revise how exactly the internet and a website is interrelated. You might have been familiar with multiple computers connected on LAN which is very common at workplace or at institutions. In this LAN, you can access 'shared items' from another computer connected on the same LAN. The basic procedure you follow to access is you browse that computers IP address. Assume this LAN is not limited to local area, it is expanded across the globe then it will be called as International Network or Internet in common language. So every computers IP address can serve as a location where you can share something. This sharing can be done using IIS(Internet Information Service) or Apache or other similar software. IP Adress and DNS configuration. To hide the IP address or you can say for a better remembrance, this IP address of web-hosting server is configured with a Domain Name. In this website, domain name is 'bipul.in'. When you try to browse this domain name say 'bipul.in' it resolved into the IP adress of webhosting server connected to it and your request is served. 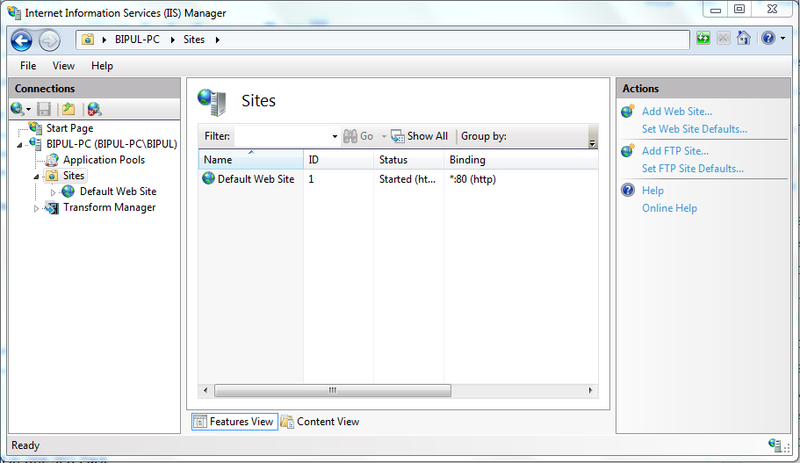 Run IIS Manager after installation. 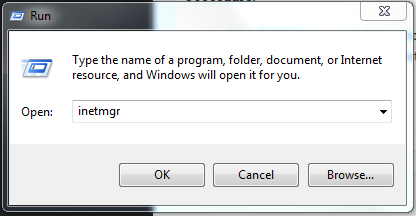 You can run it by typing 'inetmgr' in text box of RUN. Right click on site and add make a new entry. In Site name, mention your name of the website. Locate your website folder inside the content directory option. Click on connect as >> Specific user >> Set >> Windows Admin Username and password. Use the Test Setting option before you proceed. In binding option, leave the option as it is. Save the details. Please note the default site which is already there as a sample have been configured on port 80. So you need to 'Stop' that site first. To do this, right click on default site >> Manage website >>Stop. You can alter a number of setting once you are familiar with all these. But to learn initially, do with the illustrated steps. Right click on your website in that list of sites, right click on it >> Manage website >> Restart. Please note: The folder of the website must not be in 'Stop-Sharing' mode. Add an exception in firewall for port no. 80 (or may be other if you have set another port no. while doing step-7. Step to Firewall configuration: Click on new rule >> Rule type >> Port >> Next >> Select TCP and Set Specific remote port as 80. Now in browser, type your IP address, and press enter. You can find your website hosted there. Share that IP address to your friends to open it in browser. It will be serving your website on your own web-hosting server. Wow, that's what I was seeking for, what a information!